Download "SYLLABUS. 6. Office Phone and email: troy.meinke@wayland.wbu.edu; Home Phone (210) 566-7633"
1 SYLLABUS 1. Wayland Baptist University, San Antonio Campus, School of Business 2. Mission Statement: Wayland Baptist University exists to educate students in an academically challenging, learning-focused and distinctively Christian environment for professional success and service to God and humankind. 3. 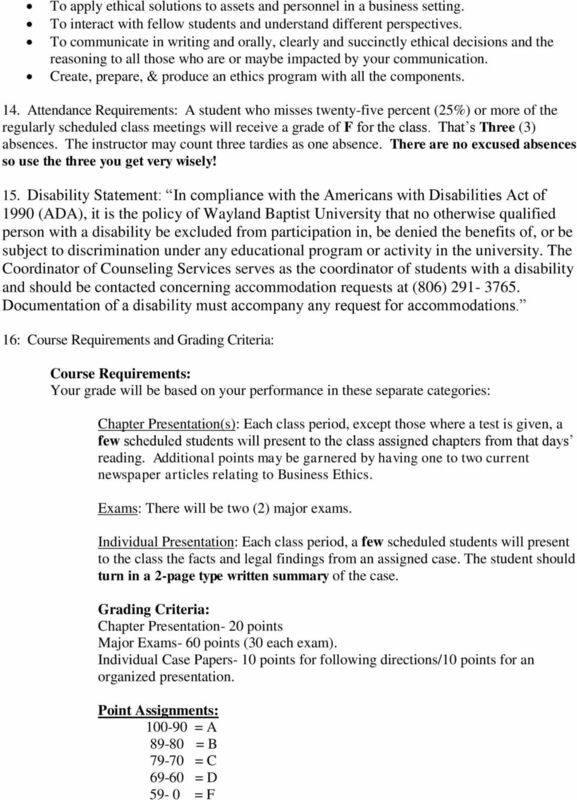 Course: BUAD 5304 SA01, Ethics 4. Term: Spring Instructor: Dr. Troy Meinke 6. Office Phone and Home Phone (210) Office Hours, Building, and Location; N/A 8. Class Meeting Time and Location: Monday, Wayland Main Campus 6:00pm-10:10pm 9. Catalog Description: systematic overview of normative ethics and a comprehensive discussion of contemporary moral issues including analysis of case studies. 10. Prerequisites: None 11. 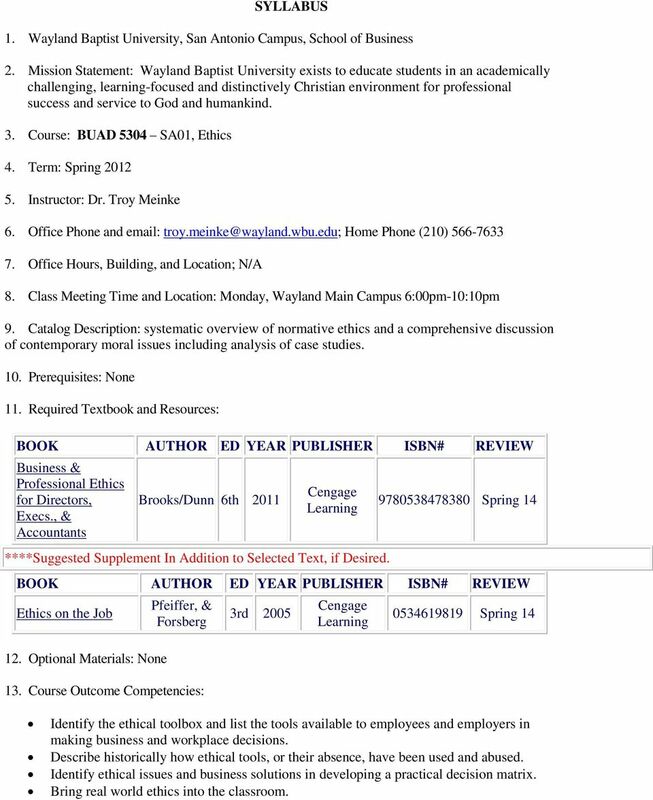 Required Textbook and Resources: BOOK AUTHOR ED YEAR PUBLISHER ISBN# REVIEW Business & Professional Ethics for Directors, Execs., & Accountants Brooks/Dunn 6th 2011 Cengage Learning ****Suggested Supplement In Addition to Selected Text, if Desired Spring 14 BOOK AUTHOR ED YEAR PUBLISHER ISBN# REVIEW Ethics on the Job 12. Optional Materials: None Pfeiffer, & Forsberg 13. Course Outcome Competencies: 3rd 2005 Cengage Learning Spring 14 Identify the ethical toolbox and list the tools available to employees and employers in making business and workplace decisions. Describe historically how ethical tools, or their absence, have been used and abused. Identify ethical issues and business solutions in developing a practical decision matrix. Bring real world ethics into the classroom. 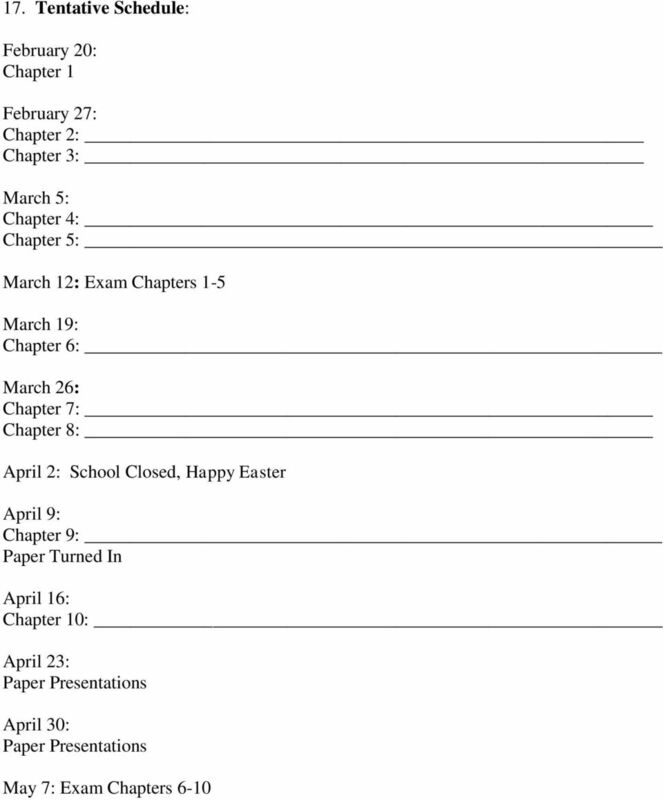 3 Make-Up Exams/Assignments: Exams- EXAM SCHEDULE IS NOT NEGOTIABLE. Any make-up exams will be considerably more difficult than the first. Assignments- If the reason for missing an assignment is valid; the student may do another assignment to make up the lost points. The new assignment is up to the discretion of the instructor. Should a student miss an assignment, it is the student s responsibility to contact the instructor and either withdraw from the class or set a realistic timetable with the instructor to turn in the work. 5 INDIVIDUAL PRESENTATIONS February 27: Betaseron Decision (p. 46) Magnetic Toys (p. 47) Bausch & Lomb (p. 48) Where Accountants (p. 49) March 5: Goggle vs. China (p. 37) Bhopal-Union Carbide (p. 41) Texaco: The Ecuador Issue (p. 43) March 19: WorldCom (p. 112) Madoff (p.119) Swine Flu vaccine (p. 157) March 26: Inherited Diseases (p. 158) Terrorist Payments (p. 160) C. Correia (p. 161) April 9: Tylenol Recalls (p. 212) Smokers Good (p. 217) April 16: Ford Pinto (p. 219) Adelphia (p. 308) Tyco (p. 312) Wall Street (p. 331) April 23: Tax Advice (p. 451) Discrim. 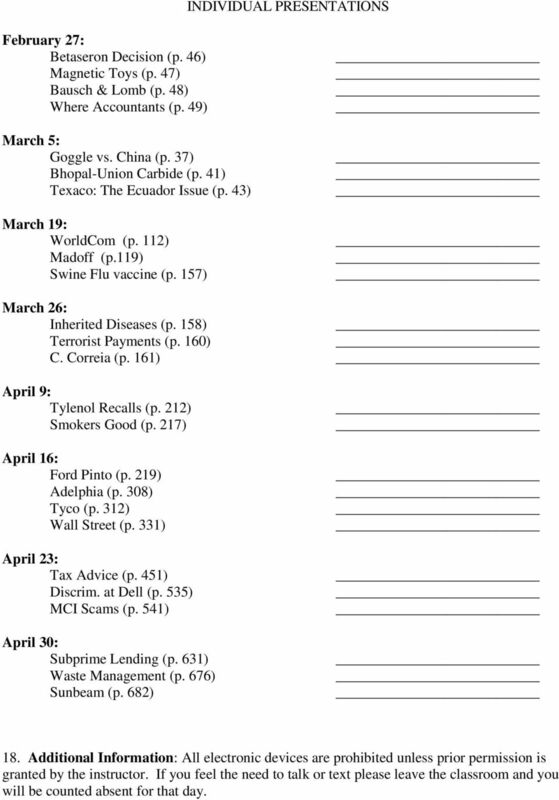 at Dell (p. 535) MCI Scams (p. 541) April 30: Subprime Lending (p. 631) Waste Management (p. 676) Sunbeam (p. 682) 18. Additional Information: All electronic devices are prohibited unless prior permission is granted by the instructor. If you feel the need to talk or text please leave the classroom and you will be counted absent for that day. WAYLAND BAPTIST UNIVERSITY SCHOOL OF BEHAVIORAL & SOCIAL SCIENCES. Virtual Campus!